Frequently cited as his last great film, Akira Kurosawa’s Ran shows the director at the height of his powers. The film, released in 1985, was a decade-long passion project for the septuagenarian director. Much like the enfant terrible of Japanese cinema, Nagisa Oshima, Kurosawa had to rely on French funding to create the most expensive Japanese film ever made at the time. Ran was Kurosawa’s second foray into Shakespeare after the Macbeth adaptation Throne of Blood in 1957. In the film, a loose adaptation of King Lear, an elderly warlord named Hidetora decides to retire and divides his land amongst his three sons with disastrous results. What follows is a series of betrayals that culminate in madness. The agendas of various characters criss-cross, and ultimately clash against each other, creating chaos throughout the land. Somewhat paradoxically, the way it all comes together demonstrates meticulous plotting that clearly owes a debt to Shakespeare. While the story is captivating, what sets Ran apart from a filmed theatre production is its grandiose use of imagery. Kurosawa has always been a visual storyteller, originally trained as a painter before taking up the camera. In the 1980s, Kurosawa’s eyesight was failing yet he would still paint storyboards. Overcoming this burden, obviously thanks in large part to a tremendous crew, Ran is perhaps Kurosawa’s most painterly film. Shots burst with artistry, beginning with an establishing shot of horsemen gazing at a vast sky. It’s a sight that can only be fully appreciated on the big screen. Ran doesn’t just boast dramatic landscapes to deliver on awe-inspiring images. It also takes advantage of colour, transforming simple conversation scenes into visual feasts. But a pleasing aesthetic is not the only achievement of Ran‘s use of colour as it can be used to evoke a theme, or even foreshadow future plot developments. For instance, Hidetora and his sons are each given a colour scheme for their costumes. While Hidetora is garbed in dazzling white, his sons wear refracted hues of blue, red and yellow. Where Ran flexes its visual muscles most though is at its midpoint, where Hidetora’s castle is overrun by the combined forces of his children. In an unrelenting sequence the audience is forced to witness the slaughter of Hidetora’s soldiers and concubines. The unstoppable brutality takes on a sublime quality thanks to the artful composition and editing. Kurosawa’s ability to cut shots is almost equal to his ability to create them. The corpses take on a grey pallor and melt into the volcanic landscape. 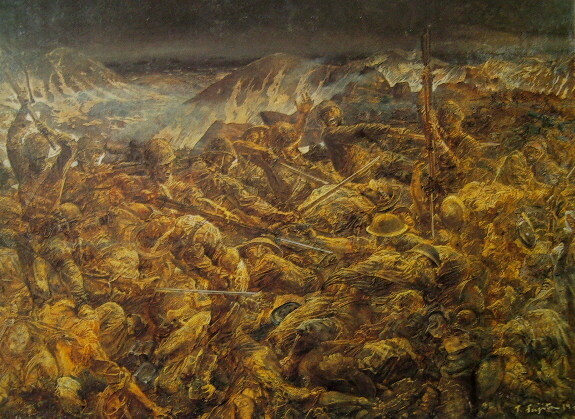 The way warring bodies become part of the earth is reminiscent of Tsuguhara Foujita’s war painting Suicidal Attu Island. So influential is this sequence that traces of it can be seen in the D-Day sequence of Saving Private Ryan. In that film, Spielberg plunges the audience into the horror of battle. Kurosawa, however, detaches the audience from the spectacle and attempts to derive, as Susan Sontag put it, ‘a challenging kind of beauty’ from the violence. Kurosawa achieves this detachment by drowning out the sounds of battle, but unlike Spielberg it isn’t to simulate shell-shock. Rather, it gives a platform to the composer Toru Takemitsu. Coming from an avant-garde background, Takemitsu imbues the entire film with a tone of utter desolation. As he takes centre stage in the castle siege, his score becomes abject in its despair. The music responds to each new shot with an overflowing misery. The rhythmic relationship between music and image becomes entrancing and exposes the beating heart of Ran, revealing it as a meditation on human misery. Ran is one of those rare films that manages to match its epic spectacle with intellectual heft. Witnessing hundreds of soldiers rush across the scene in all directions is a powerful sight, yet the ideas that are at work behind this tale evoke a profound sense of futility. Critics, including Roger Ebert, have attempted to impose a biographical reading on the film, viewing Hidetora as a stand-in for Kurosawa. However, a potentially more rewarding interpretation of the film relates to how Ran‘s philosophy reflects our own world. Everywhere we can feel the reverberations from this storm of our own making.